A piston compressor, also called a reciprocating compressor, utilizes a piston, moving in a reciprocating motion inside of a cylinder, to compress air. These innovative machines create air pressure on both sides of the piston as it completes one stroke. And, multiple cylinders can be used within a machine to create higher pressures. Piston compressors have been widely used for centuries, and with their exceptional efficiency and steady air output, it’s easy to see why. Plus, a piston air compressor is known to have a longer lifetime than other compressor types. 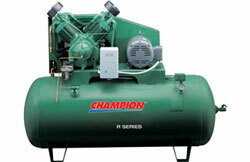 We’ve been in the compressor business for more than 25 years, so you can put your trust in our team. One of our compressor specialists can consult with you to determine whether a piston air compressor is the right machine for your needs. Call or e-mail us today to learn more about our piston compressor inventory.